After a few days of serious fishing, I took a break by doing some more fishing--this time on the Animas with my uncle in his kayak. 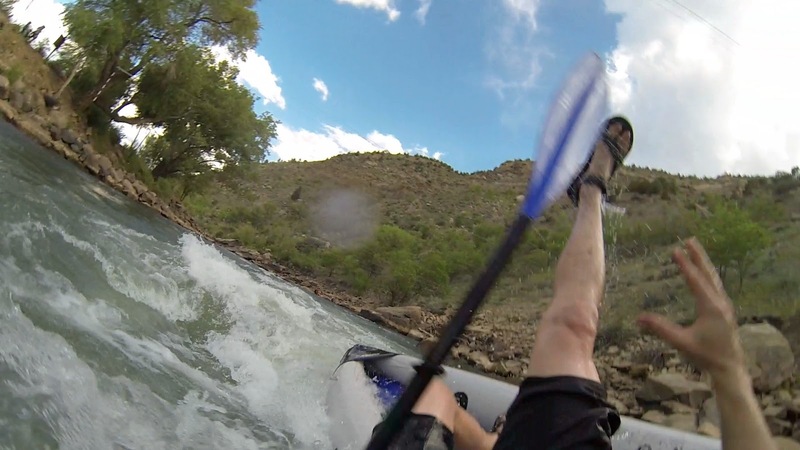 After an hour or so on the water, I made it to Gardenswartz Sporting Goods to get resupplied, and then I took my old inflatable two-man kayak to the Animas whitewater park on the edge of town. The fishing was fun even though we only caught one fish; I was clearly in over my head with the rafting. GoPro picture pulled from my rafting video. Yes, those are Tevas. The kayaking video is posted below. In my defense, I held onto my GoPro camera, my paddle, and the raft. If you have suggestions for how to keep the original video resolution when posting it to YouTube, let me know.